To withstand earthquake, there should be proper construction standards for building in the areas subject to seismic activity. 1. To develop and design buildings which have strong resistance capacity against earthquake. It is crucial to retain them light and flexible. It allows them in consuming and allocating the energy of their movement throughout an earthquake. 2. The materials which have the capacity to bend devoid of breaking should always be utilized. It leads to make the building more shock penetrable. Under this situation, TMT bars come with strong shock absorbing properties as they contain a soft inner core and a hard exterior. They contain a high elongation point and are long-lasting to resist any seismic shock. 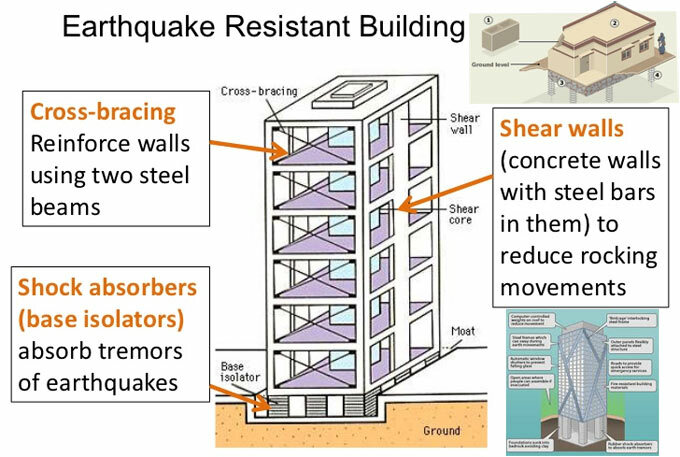 Earthquake resistant TMT bars are employed to make the structure of the building stronger. 3. The walls and partitions of the building should be light to make the building resistant against earthquake In the areas where earthquake may happen. Building up thin concrete floors also provides good solution against earthquake. The buildings become earthquake-resistant with shear walls having a panelling system and braces channelling a side-to-side force downward into the foundations of the building. 4. When an earthquake occurs, the load bearing structures experience a brittle failure. Conversely, a well-built and perfectly designed Reinforced Cement Concrete or RCC structure experiences a ductile failure. To make a building earthquake-resistant, make sure that the damage happened to the buildings lead to zero loss of human life and the damages are happened within permissible ranges and just at the proper places. The Buildings with strong earthquake-resistant capacity constructed by following the exact building code are either load bearing structures or RCC structures. The brick walls are solid in load bearing structures (ranging from 9 inches to 1 foot). These walls bear the load to the foundation of the building. The structure may contain beams, and the slab is normally built up with concrete that is reinforced with steel or earthquake-resistant TMT bars. RCC structures (also known as framed structures) are built up with concrete and steel. The load in this structure is normally transmitted to the foundation by shear walls or columns that is supported with concrete piles. 5. Load bearing structures do not contain good resistance capacity against earthquake. For this reason, it is vital to utilize TMT bars for the safety of the building and abide by the design codes as provided in the National Building Codes of India.